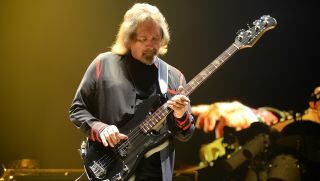 Black Sabbath bassist Geezer Butler has joined forces with Billy Idol guitarist Steve Stevens and former Guns N’ Roses and Velvet Revolver drummer Matt Sorum in a new band, Deadland Ritual. The group also features Apocalyptica vocalist Franky Perez. Butler and Stevens announced the project with short clips teasing new music on their respective Facebook pages. So far, Deadland Ritual have announced one live performance, at the French rock festival Hellfest. The band will appear on the main stage on June 22. You can check out some new music here.